Valign, align and margin will be default this way. why line 1503 and 1504 commented. when we remove comment we get the expected result. Any idea how do fix the margin as well? yes but we can ask @gitbrent why those lines are commented. But it only vixes the valign. I'm also trying to fix the margin. Any idea @ZouhaierSebri ? yes I'm signing in to this question too :) where it will be fixed ? 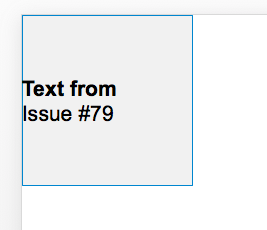 Initially, I was vexed by this as having more than 1 align tag in a paragraph was causing issues in PowerPoint 2007, so i was hesitant and didn't to trade one issue for another. After spending months on Charts, i'm glad you all reminded me to re-engage on this one. Turns out it was just a good old fashioned bug where i was placing a properties tag inside the wrong XML parent tag and it was getting tangled up. I've fixed in the current codebase - both valign and margin behave as intended. Try it out now and let me know what you think. Example below. Awesome @gitbrent, thank you so much!